The Sustainable Development Goal Nr 9 wants to build resilient infrastructure, promote inclusive and sustainable industrialization and foster innovation. In our conversation, Lisa Marti and Justine Portenier from Social Fabric changed the way I think about banana peel forever and I get to wonder why the hell I have been taught to throw out the best part! In the future, banana peels might make a nice yellow shirt. Lisa and Justine, you are Project Managers at Social Fabric, what are you responsible for? Lisa: My main responsibility is to find merchandise customers – companies, or festivals that need personalized or customized products that are made in a sustainable or fair way. I am also responsible for the refugee projects we run and the German courses we will start in the fall. Justine: I am responsible for retail sales and products. I am looking for clothing shops, museum shops and online stores that can sell our clothes and products. In the beginning I was responsible for building public connections and partnerships. But the role quickly developed into building customer relationships with retailers, foundations and people in our community who are interested in Social Fabric. What was your biggest success during the last two months with Social Fabric? Justine: The biggest success for us was making friends and meeting the people who work here. But, in my role as a sales person, it is the amount of retailers we gained as new customers. My target was finding eight and I found eight, including two online shops. And because I am from Basel, I really wanted to bring Social Fabric there. I found two stores in Basel that agreed to sell our products and that made me happy. Lisa: One success was that we really felt part of the team. Unfortunately, securing merchandise partners was a little bit more difficult. I found a couple and we are in contact with potential partners (as google), but right now it’s a “yes maybe” and I don’t want to celebrate before they say yes. We also participated in Mass Challenge and presented a pitch. Afterwards, the Head of Migros Product Management came to us and is now our mentor. What do you think was the bottleneck for finding merchandise partners? Lisa: One is pricing. Of course we can’t compete with people who produce in unsustainable ways or very cheap. You can find merchandise T-Shirts for CHF4, which we cannot compete with. Another reason is that companies or festivals have long-term contracts with their partners. It is a long process to see change happen. Perhaps we still need to find the right sector to collaborate with. What has been different about your Summerpreneurship with Social Fabric from other internships or summer jobs? Lisa: What was different from the beginning, was that Heather didn’t list us on the website as interns, but as Project Managers. And that’s how she communicated us to partners. She doesn’t see us as someone who brings coffee but a full member of a team. 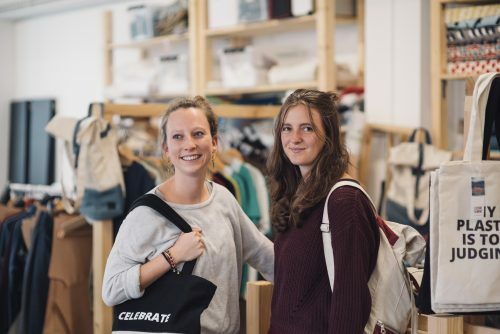 Justine: I think the biggest difference is taking part in a program through the Summerpreneurship at Impact Hub Zurich. You meet other interns, you have a huge exchange and a lot of input around entrepreneurship. It was difficult to explain to our friends what we were doing because we were at Social Fabric, at Impact Hub, at Mass challenge, in Zurich, Lausanne and all over the place. I got access to the start-up world and I don’t know if I had found an internship like this through a normal job website. How is your project contributing to Sustainable Development Goal No.9– Industry, Innovation, Infrastructure? Lisa: The big vision is to disrupt the industry and be really innovative around new materials. The fashion industry is not a very innovative sector compared with for example the technology sector. Heather, the founder of Social Fabric would like to produce fabric out of food waste or other agricultural byproducts. Most fabrics are naturally plant based. You could for example use the skin of leftover bananas that weren’t sold at the supermarket and turn their fibres into fabric. That would change the way the fashion industry works and fabrics could also be made out of plants that grow locally and be produced locally. Justine: The decentralization of infrastructure in the industry also is a big problem. Clothes are often made thousands of miles from where you live and that needs to change. Clothes also should last for a long time. 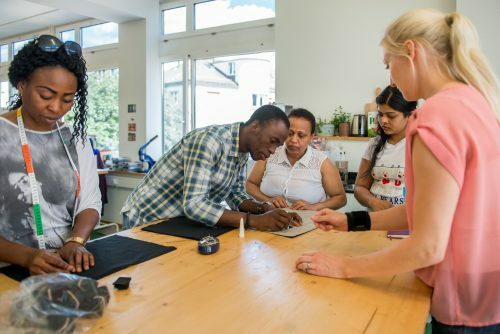 Social Fabric is scaling their activities this fall and as part of that you are also running a crowdfunding campaign to further collaborate with communities abroad. Could you share a little bit about the communities you will be working with? Lisa: One production partner is Freeset in Calcutta, India. It’s an organization that works with women who formerly worked in prostitution. They give them the opportunity to work in fair conditions with sustainable materials and share our goal of creating environmental and social change. Justine: We also have a partner in Romania – Mai bine. They work together with young people who have a hard time finding employment. Heather went on an exchange trip to see how they work and live. For her it’s important that she can see the local conditions. They will probably help us producing the new backpacks our team designed. Then we have a partner in Greece, SOFFA, that works with refugees. We are still working out the partnership with them. They potentially are a partner who will bring new opportunities and also can help us grow. 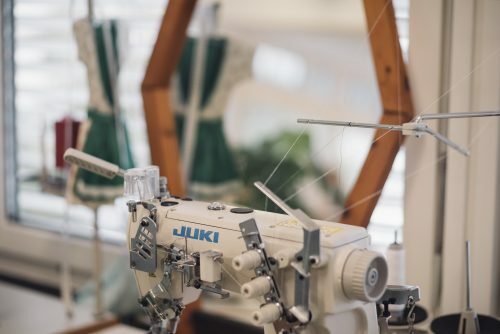 Justine: When you work in the textile industry it is important to focus on your local area. But the textile industry is distributed globally and we want to create opportunities at Social Fabric to think global and for other people to grow together with us. What’s the funniest or most exciting thing that has happened to you while working for Social Fabric? Justine: I had a nice and funny story with my colleague Zeit from Eritrea. She is a very nice and shy woman who is very open. We were sewing together and she said she has problems with her skin. I wanted to make her feel better and I said:”hey look at my face. Can you see all my freckles, that’s normal it doesn’t look ugly.” She said: “Oh, that’s true, have you been to hospital to show them what you have in your face?” And then I thought wow, that’s the first time someone asked me if I have been to the hospital to show my freckles. I really had to laugh out loud. I think she didn’t know what freckles are and because we first talked about something bad she didn’t realize that I wanted to show her that it isn’t so bad, but maybe a little uncommon. We do have a lot of people from all over the globe here.They don’t yet speak the languages we understand and they say whatever they want, so there is a lot of laughter. What are you personally dreaming of doing in the future? Lisa: I still would like to do my Masters degree on peace and conflict studies, or development studies focused on education and migration. Afterwards, I would like to work in the social sector perhaps with my own social startup or also working for an NGO. Justine: My closer future will look at a Masters degree and continue working at Social Fabric. I think that’s a great future to have for now. And further, I don’t know yet. I came into social fabric and it changed my next few years. I hope it will continue like this and that I will contribute to something like Social Fabric.